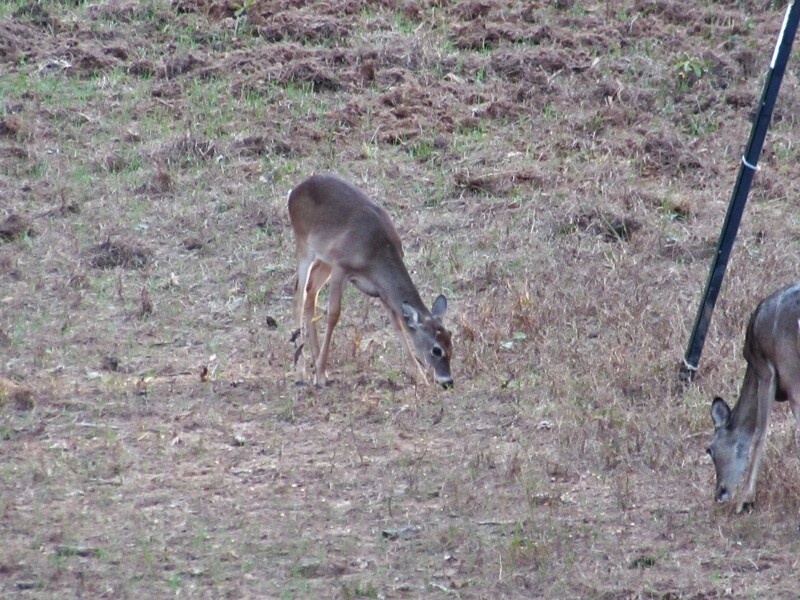 This past weekend marked opening day of deer season in Texas. And, considering we have a half of beef and several wild pigs in the freezer, I have decided to trophy hunt. In other words, unless it is a massive buck, I’m just gonna sit and watch and enjoy being perched in a tree. Alone. First morning I sat for an hour with zero action. Until I noticed a moving pile of dirt in the small meadow ahead of me. It was the biggest gopher in Rusk County, Texas. He kept me company until I decided to head back home, a short 10 minute walk. Those buggers can move some serious dirt! He made me tired just looking at him. That evening was MUCH more productive! I went farther into the woods and saw 2 button bucks, 3 does, a yearling doe, 3 wild hogs, a skunk and a bat. I also saw a HUGE buck. However, he was chasing the girls and was quite deranged. Maybe next time. Quick side note: See how the ground is bunched up and there are mounds everywhere? That is what wild hogs will do to your perfectly smoothed food plot, hay meadow, orchard, garden or yard overnight. They are the DEVIL. Moving on…..
See the buttons?!? So cute! But, Monday it was back to work and with the time change I come home in the dark. Which I hate. I could go hunting in the mornings, but mornings are so busy and if I actually harvested anything I’d be in a pickle since I’m alone in the mornings. So, waiting for tomorrow to crawl back up in my tree. Tomorrow I’ll be off work and we just had a cool front, yay! 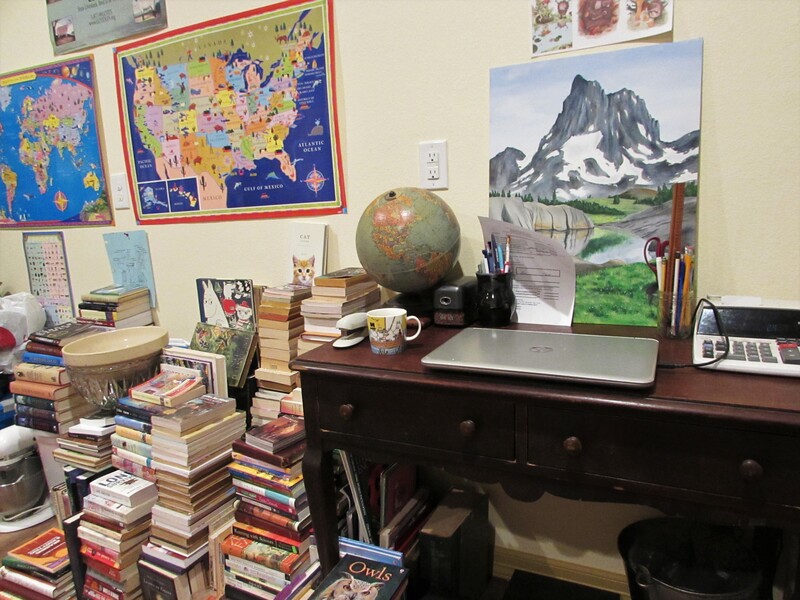 I’ve missed blogging, and I got my desk set up this past week. Finally. It is sitting in what will be the kitchen. If we ever get a kitchen, I’ll be incorporating a new desk about where this one sits now. Until then, I’ll keep grilling outside and dusting around my massive piles of books. And maybe, just maybe, since I have a space set up, I’ll get to blog more often. Love you, peeps! Hope you have a great Wednesday! bought some acreage with good places to put a stand! I have a grand son-in-law I hope can bag himself plenty of deer meat! He is really good at preparing it! Good to see you up to posting again! Take care!! Glad you got some acreage, that is always exciting! I really wanted to shoot one of the pigs I saw but they were in deep brush to far away, I’m sure I’ll get another chance though. Hope you never have to deal with them! Good luck to your grand son-in-law, hope he gets a whopper! Biggest. Gopher. EVER! Somewhat frightening. That gopher looks big enough for a pot of stew,lol! Really enjoy your blog!! !